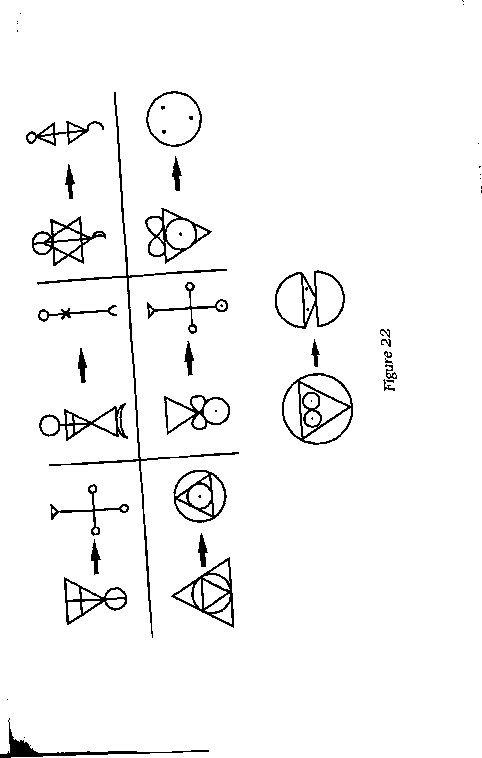 i We will now discuss one of the most fascinating Chapters of Spare's sigil magic, the Alphabet of Desire. ■ it is also one of the more complicated and less explored areas, not the least reason for this being the desolate ^situation of literary sources. Spare's writings per se are very ambiguous and difficult to follow, and his exposition of the Alphabet of Desire is no exception. Even concerning his original comments we can only rely on Kenneth Grant,8 who seems intent on concealing more than he wants to divulge. Spare's original system (a fact which was pointed out to me—somewhat indignantly—by Frater. '.Thanatos of the O.T.O. ), but, as I see it, Carroll is on the right course. To date, the German author Markus Jung-kurth9 has been the only writer who deals with Spare's alphabet in more detail. But while he does quote the odd word or two from Spare's own writings by way of explanation, he gives us veiy few clues for actual practice, unfortunately. Spare's statement that the Alphabet of Desire is part of a special proto-language of man's (or possibly actually Spare's) own unconscious does, however, give us an important practical clue, particularly if we are familiar with the techniques involved in construing artificial ritual languages.10 It would be wrong to assume that Spare, who as a magician was an absolute pragmatist, understood it as being a universal and categorical proto-alphabet for use by all people. This would contradict his entire system, and we do not have a single convincing indication why we should take this for granted. The following explanations should, therefore, be understood as my own, personal interpretations. The approach described hereafter has proved to be effective enough in my practical work, and we can find similar methods in other systems as well,11 but we must admit that we are more or less breaking virgin soil here. 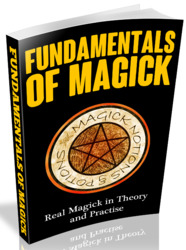 The advantage of this approach is that it leaves enough room for personal exploration, which might especially appeal to the more experienced sigil magician. Basically, I shall describe two main forms of approach and ways of dealing with the alphabet in this chapter: 1) the Alphabet of Desire as a principle of structure embedded in a framework; and 2) the Alphabet of Desire as a mirror of the psyche created by chains of associations. Although some overlappings inay occur occasionally, one should not be misled to forget that these are truly two entirely different approaches. Pete Carroll has presented us, in his well-known laconic and precise manner, with this model in Liber Null (pp. 76-87). Unfolding his system, he does not base it—as did Spare—on purely sexual functions. Strictly speaking, his system is more of an "Alphabet of Emotions." These emotions he arranges as "complementary dualisms": FRIGHT/ATTRACTION, JOY/TERROR, GREED/AVERSION, etc. Not all of these complementary dualisms will seem convincing at first glance. For example, it may not be absolutely clear to everybody why ATROPHY/FRUSTRATION and RELEASE/DISSOLUTION should be seen as supplementary oppasiies, and even his scant explanations do not help us a lot. Incidentally, he does not stick strictly to Spare's division of 22 either, so we are justified in viewing his system as being an original creation of his own, following the Spare tradition. TNG; RAPTURE/ANGER; GREED/AVERSION; AT-TRACTION/FRIGHT; JOY/TERROR; ATROPHY/ FRUSTRATION. Additionally, there are four categories which are, so to speak, "outside of competition": LAUGHTER, DECONCEPTUALIZATION, CONCEPTUALIZATION and UNION. And finally, he adds a "Supplementary Alphabet in Malkuth," which in his system covers the so-called "somatic emotions," namely PAIN/PLEASURE and DEPRESSION/ ELATION. levels. The Mercurial form indicates states of overstimulation and dissolution of consciousness followed by catharsis or ecstasy (p. 76). The Sulphurous form indicates "the normal functional mode of the emotion," thus lying in between the Mercurial and Earthy mode, both of which derive from the first principle, comparable to the state of the "prima materia" in alchemy. The Earthy form is one of repression and unrealistic/unrealizable emotions. which we have already dealt may be assigned to the above-mentioned generic terms. Thus, for example, LOVE (COAGULA level) includes emotions like ATTACHMENT, PASSION and RAPTURE, whereas their opposites (LOATHING, AGGRESSION and ANGER) belong to the category of HATE (SOLVE level), etc. This may appear rather complicated, and it probably is. For further details, please refer to Liber Null itself. Let us take dualism, for example. Most people are familiar with polarized thinking and perception, independent of their cultural or civilizational background, of political, historical, economical or social factors, etc. Even the ontologicai monism of many religions and philosophical systems is a convention of revolt against this polar/dual view, thus defining itself by denying it. It is of no consequence at all that most systems (including the purely magical ones, not to mention those of mysticism) look for a synthesis and dissolution of the polarities. This quest for the Grail is essentially a proof for the existence of dualism, at least when viewed as an ontologicai problem. Now we understand that the Alphabet of Desire has developed into a significant instrument of the dawning of consciousness merely by having been created. If you want to construct your own alphabet following the structuring method described above, you will have to figure out those elements which you want to include and which can personify the energies of your own psyche. Just listing them is not good enough, however. You will have to find a proper framework for them. How to use alphabet of desire? How to use sigils for desires? How to create an alphabet of desire? How to create alphabet of desore?